Control of infection principles must be applied in each and every situation, and not only when infection hosts are known or suspected. 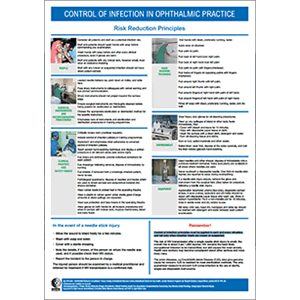 This A2 size poster covers risk reduction principles for people, surgical instruments and decontamination procedures, clinical practice and safety issues, hand washing technique, environment and equipment. It also explains what to do in the event of a needle stick injury.